CD Genomics is providing PacBio Single Molecular Real-Time (SMRT) sequencing to increase your research method for bacterial whole genome sequencing. A comprehensive view of the bacterial genome, including genes, regulatory regions, IS elements, phage integration sites, and base modifications is vital to understanding key traits such as antibiotic resistance, virulence, and metabolism. SMRT Sequencing has long reads (average >15,000 bp, some reads >100,000 bp) and the highest consensus accuracy. It is especially helpful for genome de novo assembly. As we all know,repetitive stretches of DNA are abundant and are one of the main technical challenges that hinder accurate sequencing and genome assembly efforts. In the case of bacteria, the rRNA gene operon is often the largest region of repetitive sequence and range in size between 5 and 7 kb. Microbial whole genome sequencing by illumina HiSeq platforms utilizes sequencing by synthesis technology, that is limited by its read length, currently ranging from 50 to 300 bp, and as it requires PCR amplification of multiple DNA templates before sequencing, there is potential for base-composition bias which may bias the G+C content of the sequences. The advantage of SMRT long reads, which can overcome the problem of abnormal GC and high duplication of bacterial genomes, often assembled into a single contig. Among all assemblies, the PacBio assembly recovered the highest number of core and virulence proteins, and housekeeping genes based on whole-genome multilocus sequence typing. It is easier to achieve complete assembly or fine map, and help you rapidly advance your research to explore the genetic structure and functions. Our highly experienced expert team executes quality management by following every procedure to ensure comprehensive and accurate results. 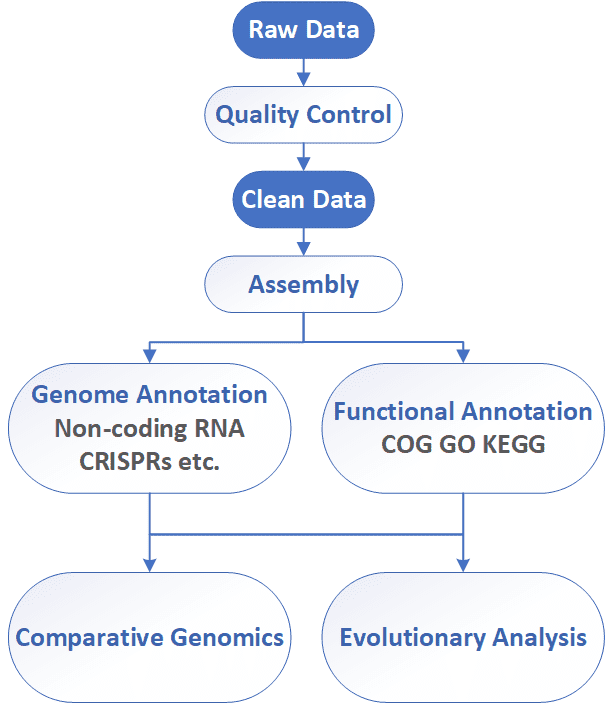 The general workflow for bacterial whole genome sequencing is outlined below. At CD Genomics, we are using the long-read PacBio Sequel platform to support researchers all over the word with bacterial de novo whole genome sequencing needs. Our bioinformatics analysis include: Genome assembly and polishing, gene prediction, genome annotation, and comparative species genomes analysis. As one of the most famous industry leaders who is skilled in sequencing, CD Genomics not only concentrates on developing cutting-edge technology but also be willing to share our state-of-the-art platforms and sufficient expertise with our clients to promote their brilliant studies. It is our guarantee to provide customers with the best services and finest results at CD Genomics. 1. What indicators can be used to evaluate bacterial genome assembly? The common indicators for the quality of genome assembly include scaffold N50, N%, scaffold numbers, and the total number of base pairs. 2. How to achieve zero gap? Currently, the complete sequence map of more than 90% bacterial strains can be constructed by making use of a combination of Illumina HiSeq and PacBio SMRT systems. Pacbio RS II system can achieve complete genome assembly even in the regions of high or low GC content, as well as repetitive sequences. The complete sequence map of the rest 10% bacterial strains can be achieved with Sanger sequencing data. CD Genomics has completed hundreds of bacterial genome assembly cases without gap.